A second round exit at the recently concluded Liebherr 2018 European Championships in Alicante was not the end result for which Austria’s Liu Jia had hoped; the no.11 seed, she was beaten by Poland’s Katarzyna Grzybowska-Franc. It is a tournament in which she has previously enjoyed success; in 2005 in Aarhus, she was the winner, in 2008 in St Petersburg and two years later in Ostrava, she concluded play in the second step of the podium. It is a proud record; now at the forthcoming Uncle Pop 2018 ITTF Women's World Cup, play commencing in the Chinese city of Chengdu on Friday 28th September, whatever the outcome she will set a record. The now 36 year old, the player who in 1998 in Norcia and the following year in Frydek-Mistek won the Junior Girls’ Singles title at the European Youth Championships, will be making no less than her 13th appearance in the Women’s World Cup. It means she goes one ahead of Hong Kong’s now retired Tie Yana who competed 12 times, a lady with a record to note. A debut in Singapore in 2002, one year after Liu Jia had appeared for the first time in 2001 in Wuhu, Tie Yana was ever present until 2012 in Huangshi, before after the birth of her child, returning to action in 2016 in Philadelphia. She was the runner up in 2008 in Kuala Lumpur losing to China’s Li Xiaoxia, on three occasions she finished in third position; five times she was fourth and twice a quarter-finalist. Only in 2009 in Guangzhou, when beaten by both Singapore’s Feng Tianwei and the Korea Republic’s Kim Kyungah, did Tie Yana not reach the last eight. 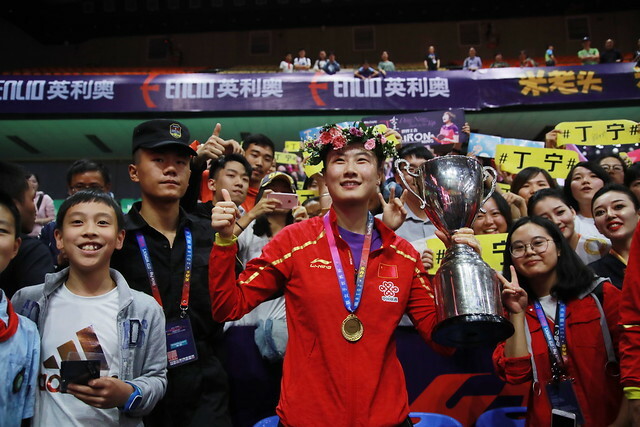 Four times a place on the podium, for Liu Jia such a goal has proved elusive. On her first five appearances she finished in third place in her group and did not progress to the quarter-finals. However, she could count herself somewhat unfortunate. In 2004 in Xiaoshan, on games ratio she finished in third place behind Viktoria Pavlovich of Belarus and Kim Kyungah; two years later in Urumqi she experienced the same fate. She caused a major upset by beating China’s Li Xiaoxia but then lost the Kim Kyungah in five games, a player who then experienced a seven games defeat at the hands of Li Xiaoxia. Later in 2013 in Kobe when play was organised in two groups, she finished in third place in the second stage group matches behind Feng Tianwei and Japan’s Ai Fukuhara; likewise, last year in Markham, in the opening round, she was beaten by Li Jie of the Netherlands. Thus what could be considered ninth place was her lot for the sixth time. Always competitive, on the other six occasions, the end result has been a quarter-final finish; departure being in opposition to most worthy opponents. China’s Guo Yue, Li Xiaoxia, Liu Shiwen and Zhang Yining alongside Japan’s Kasumi Ishikawa and Chinese Taipei’s Cheng I-Ching being the players to halt adventures. In 2007 Chengdu, she lost to Zhang Yining, two years later in Guangzhou Guo Yue ended progress, before in 2013 in Kobe Liu Shiwen proved in nemesis. Later in 2015 in Sendai, she lost to Kasumi Ishikawa before in 2016 in Philadelphia, Cheng I-Ching proved too consistent. In Chengdu, Liu Jia is the no.16 seed, she will commence play in the group stage of proceedings; the goal to finish in first or second position and thus earn a main draw place. Such is the immediate goal but the ultimate goal is surely to advance two rounds in the main draw; for Liu Jia could 13 prove a lucky number?